(We are reasonable people and if we are truly at fault, or made a mistake, then we will make it right.). WORKS GOOD! Check the pictures for details. Very Good condition Eton Grundig Edition Traveler II. Tested and working 100%. Good luck! Eton Sound 100 digital clock radio. Perfect working condition. Great Eton sound from a small radio. In overall good shape, no major scratches, cracks. 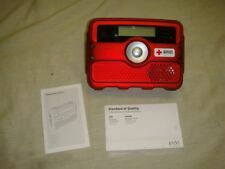 ETON FR800 WEATHER TRACKER RADIO W/EMERGENCY ALERT/AM/FM CLOCK RADIO -LOOK! 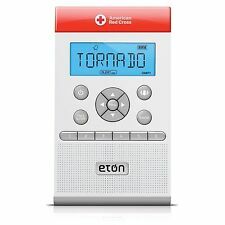 You are bidding on ETON FR800 WEATHER TRACKER RADIO W/EMERGENCY ALERT/AM/FM CLOCK RADIO. This is a used unit that other than some minor wear marks from rubbing in transit, is like new. It powers up and works perfectly. It comes with the user guide/paperwork as shown. Don't miss out on your chance to save big-time!! . 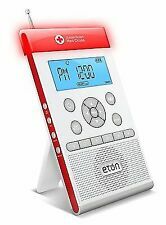 Eton Blackout Buddy Radio Light Clock Emergency Power Failure Plug-In FR100 New. Condition is New. Shipped with USPS Priority Mail. 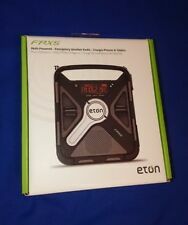 ETON FR100 BLACKOUT BUDDY POWER FAILURE PLUG-IN RADIO LIGHT AND CLOCK NEW! The built in LED light and AM/FM radio automatically turn on when the power goes out. 12-16 hours of Led light use and 4-8 hours of radio use. Auto Tuning storage (ATS) function. AM/FM/LW/SW Bands. Bonus Carrying Case. Manufacturer Model:NGWTIIIB. Auto tuning storage (ATS) function. Single alarm clock (by radio or buzzer). Style: ZoneGuard. Item model number: ARCZG100W. ZoneGuard is a slim, sleek and super advanced weather alert radio and alarm clock that will make sure you’re safe and sound and in the know. AC Adapter included. ZoneGuard is a slim, sleek and super advanced weather alert radio and alarm clock that will make sure you’re safe and sound and in the know. AC Adapter included. 3 x AA battery (not included). Bright 3-LED flashlight. The FRX3 is a solar and hand turbine powered AM, FM, weather radio with alarm clock. To listen to personal tunes, use the AUX-input to play an external MP3 player! AM/FM/NOAA weather alert radio with back-lit LCD display and illuminated buttons. ZoneGuard is a slim, sleek and super advanced weather alert radio and alarm clock that will make sure youre safe and sound and in the know. AC Adapter included. 3 x AA battery (not included). 3 level High-visibility color alert light bar (Green - Watch, Orange - Warning, Red - Alert). Auto tuning storage (ATS) function. Single alarm clock (by radio or buzzer). In the case of factory defects, we will replace the product for you. We do our best to process as quickly as possible. If there’s a problem, just let us know and we fix it. Style:ZoneGuard ZoneGuard is a slim, sleek and super advanced weather alert radio and alarm clock that will make sure you’re safe and sound and in the know. AC Adapter included. 3 x AA battery (not included). ZoneGuard is a slim, sleek and super advanced weather alert radio and alarm clock that will make sure you’re safe and sound and in the know. AC Adapter included. 3 x AA battery (not included). ZoneGuard .